The following is part 4 of our series on Worship (and Music) as Language. Read Part 1, Part 2, and Part 3 for the back story. Art is a cry of distress from those who live out within themselves the destiny of humanity, who are not content with it but measure themselves against it, who do not obtusely serve the engine to which the label ‘unseen forces’ is applied, but throw themselves into the moving gears to understand how it works. They are those who do not turn their eyes away to protect themselves from emotions but open them wide to oppose what must be attacked. They do, however, often close their eyes to perceive what the senses do not convey, to look inside of what seems to be happening on the surface. Inside them turns the movement of the world; only an echo of it leaks out – the work of art. A Concise History: From “Aphorismen” in Die Musik, Berlin, 9. Jahrgang, Vol. 36 (1909 – 10):159. 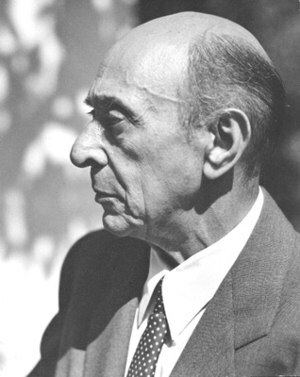 Schoenberg encapsulates here a trend that had been occurring in music over quite some time. With the onset of naturalism and impressionism in art, music was soon to follow. Where in previous days (specifically those of Bach) art was experienced and produced for a higher cause (namely, the glorification of God). Depraved humanity, following Schaeffer’s “Line of Despair”, was no longer producing art predominately for the glorification of God nor the edification of people, but rather simply for the sake of “art” itself. This presents numerous problems, because now art is a self-serving entity unto itself, no longer moored in the foundation of the Holy but rather pointing all glory back to itself. When this shift happened, art was no longer about being appreciated or consumed by the general populous. Instead, art had turned inward… it did not matter if people “got” it or not, because that was no longer its aim. We see this as a perversion of the very foundation of all that is good, true, and beautiful. The gifts of the creation were not meant to serve themselves, but rather to serve unto the glory of God. The public outcry against music that was unintelligible was stark and piercing. The attitude of the public towards modern music is affected to an immense degree by the circumstance that the impression it receives from that music is inevitably one of obscurity. Aim, tendency, intention, scope, and manner of expression, value, essence, and goal, are all obscure; most public’s consciousness of its own needs and wishes. All works are therefore valued, considered, judged and lauded, or else misjudged, attacked, and rejected, exclusively upon the basis of one effect which all convey equally – that of obscurity. Musicians had taken their cue, and were retreating into the obscurity which they felt would give them the peace and solace that they needed to explore their craft. And so society adapted, and did what could only be expected in the void left. Up until this point, there were two voices heard in music, if they may be so generally called. There was a Majority Report, and a Minority Report. The Majority Report from days of old (mainly driven by the church), more specifically from 1600 until about 1900, the “music of the day” was performed largely in the concert hall and taught in the conservatory. The Minority Report was folk music… music that would be performed in the bars, the taverns, the homes, and the back porches. After the onset of the creation of the elite Society, there was a great schism in music. There was no longer a public outcry for high art, for indeed high art had abandoned the public. Thus the schism occurred, and the reports shifted. Now in the distant minority of the public’s eye was classical or “high” art, and in grand pre-eminence was folk art. No longer was music something that required training, deep interpretation, and formulas to compose. Instead, music could be appreciated in its raw form… the form of folk art. Blues, Jazz, Wind and Big Bands, Rock and Roll… all of this evolved in the void left by those whom society had once looked to provide music. And composers in America followed suit. Vaughn Williams, Copeland, Sousa… all began looking for “authentic” music, as was indigenous to the people, that they would use in larger compositions. Singing Billy Walker traveled much of the southeast as he compiled the “Southern Harmony”, a hymnal of music and tunes found only in the indigenous south. Neo-Classicism and Intellectualism was out, and in its stead was a consumer product that met the demands of the day. The generational lines quickly blurred with the onset of technology. Radio, Recordings, Television, and the Internet have all made music so tremendously accessible that anyone at any time can hear and see what everyone else is doing. The world has been brought closer together; in fact, styles now become “in” and “out” so quickly that we can no longer really ascribe a certain genre to a certain generation. Our final task in this series will be to try to make sense of this data in terms of the church’s response.